Integrating ImunifyAV will give cPanel & WHM the benefit of automatic scans of hosted websites, alerting for infection with malware. If any of the websites are found to have malware on it, users of the free ImunifyAV will receive notification through the ImunifyAV control panel in the Files tab. For users that upgrade to ImunifyAV+, the option to receive an email notification to the control panel’s administrator email address is available. 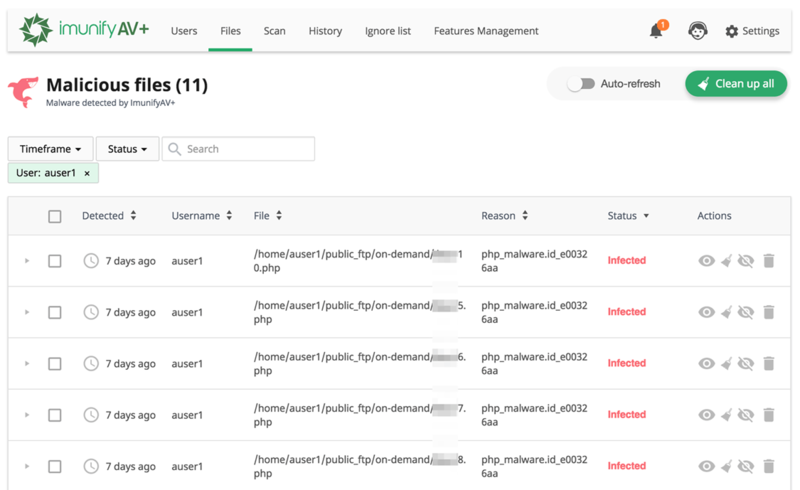 If any malware is discovered, ImunifyAV provides cPanel users the choice to either clean the infection themselves (with ImunifAV provided instructions) or upgrade to ImunifyAV+ to have the infection removed automatically by the software. In addition to ImunifyAV, hosting providers can choose to move to Imunify360, which is the only multi-layer proactive defense suite for web hosting, and purchasable directly from your WHM interface.